In 1931, after a manufactured "incident," the Japanese Army conquered Manchuria. They then set up what is always referred to as "the puppet state of Manchukuo," with a Chinese Prime Minister and the sad Pu Yi (the "last emperor of China") as head of state, but with all real power wielded by Japanese "deputies." Manchukuo was a brutal colonial regime where hundreds of thousands of Chinese and Koreans were treated as slaves, but it was also a grand experiment in economic planning. 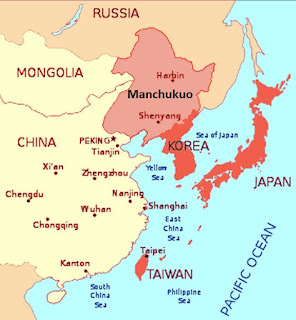 Manchukuo had vast deposits of coal and iron ore and by 1931 it already had the beginnings of an industrial complex. The Japanese leadership set out to make it into a economic engine that would power their war machine. They sent thousands of young Japanese to make this economic explosion happen. In a peculiar irony, many of the economics and engineering majors sent to Manchukuo were leftists. Knowledge of Chinese was a prerequisite, and at that time it was mainly leftist or otherwise counter-culture Japanese who studied Chinese, a decadent tongue rejected by nationalists. Also, in the 1930s it was difficult to find a good job in Japan, and left-wing leanings made it even harder; it was actually illegal in Japan to write or speak anything that advocated changing the political system. Shut out of the Japanese bureaucracy and the big corproations, ambitious left-wing students flocked to Manchukuo. In Manchuria, those Japanese planners achieved what they set out to. They multiplied production of iron ore, coal, and steel, and expanded the economy into chemicals, automobiles, airplanes, and more. They built an impressive railway system to move all this around, which is still in use. At first this was done by direct state intervention, under a five-year plan modeled on Soviet plans. But in preparing for the second five-year plan it was decided to open up the field for investment by Japanese industrial conglomerates, the zaibatsu. Sold on the virtues of dictatorial control and a vast work force of semi-slaves, the zaibatsu responded enthusiastically. Nisan moved its headquarters to Manchukuo and created an industrial empire, and the other top firms also made large investments. But the economy remained state-directed, companies investing only in enterprises approved and generally created by the state planning agencies. The director of Manchukuo's economy in this period was a man in his late 30s named Kishi Nosusuke. In 1941 Kishi moved back to Japan and became Vice Minister of Commerce and Industry, a post he held until the end of the war; most historians think that by 1943 he was in charge of Japan's economy. At the war's end he was jailed by the Americans and charged as a war criminal, but his trial never came up and in 1948 he was released. After a few years of retirement he re-entered politics as a conservative legislator and in 1957 he was elected Prime Minister of Japan. There he continued to promote the same economic policies Japan had developed in the early 20th century and perfected in Manchukuo: private investment firmly guided by the state toward national goals. The World War II era was not just a time of immense conflict, but the apogee of rational planning in economic affairs. All the wartime economies were under government control, even in the US, and it led to staggering production of war material: to take one example, the US launched more than 6,000 ships during the war years, including 28 aircraft carriers. From that experience most of the world took the lesson that planned economies did better, and outside the US the economic growth of the 1950s and 1960s was heavily planned and managed by governments. Then in the Rust Belt era of the 1970s that started to go sour, and people in Europe and the US turned toward freer markets and lower taxes to get growth going again. I wonder: was either the obsessive planning of 1930 to 1970 or the turn against it rational? Or was it just a change of intellectual fads? Did central planning make more sense in the coal and steel era than today? Or was it that consumer choice was just not very important in 1930 to 1970, so central planners were better able to make what was wanted? I find this all puzzling, and I have grave doubts that neoclassical economics can really explain any of it. The authors explore exactly that shift between planning and deregulation. Based on wikipedia, I'm skeptical. The authors just seem to like neoliberalism. They can't account for why central planning was so successful in Japan in 1950-1985 or Korea in 1960 to 2010. Why was central planning a disaster in India but not Japan? 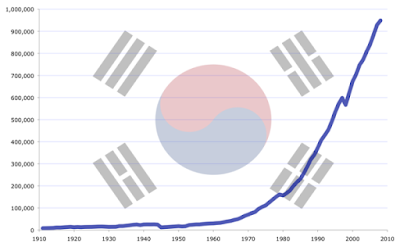 Why did central planning cease to work in Japan, if it really did cease to work? The authors seem to complain about subsidies to old industries in the name of jobs and stability, but on the other hand we let those industries die and got Donald Trump. Why did central planning work for Stalin in the 1930s but not Brezhnev in the 1970s? Why has the managed German car industry done so much better than the free market British car industry, or the managed French car industry? I'd argue it's not so much the method of management, but the quality of management that matters. Most any half-decent system can be made to work reasonably well if the people involved are properly devoted to making it work, and competant at doing so. But if your system becomes compromised by corruption, greed, incompetance and other major mismanagement factors, things will start to go downhill over time. If the people operating your economy are all dedicated, educated, and principled in their pursuits, then in the absence of other other major destabilizing effects, not only should everything should work more or less according to plan, but the plan itself should be of high quality, and the goals you achieve will be properly meaningful and sufficiently impactful. In American corporate culture, there used to be at least some expectation of excellence and civic responsibility. Businesses were of course still designed with the goal of making money, but even more important than profits or growth was providing a valuable public service and enriching the nation and society in doing so. The idealized corporate president or CEO was respected not just because of their extensive wealth and influence, but more significantly because of how they chose to employ those vast resources, seeking to generously give back to the community instead of simply lining their own pockets ever deeper. But slowly over time, the focus of corporate enterprises shifted more and more toward naked greed and establishing a de facto plutocracy. Wealth and power went from being a means to an end, to being an end in and of itself. Bearing this in mind, I imagine that if you compare different centrally planned economies, you may find that the key distinction between those that failed and those that succeeded was in whether they were being put to proper use. I would assume that the post-war Japanese centrally planned economy worked so well primarily because it was being operated by highly competant, driven individuals who shared a common cause and goals - helping the nation recover from the ravages of the war, and achieving security and stability in a now wildly chaotic Cold War world. But once affluence and comfort was achieved, that's when the culture of management began to shift away from civic duty and running the country well, and instead toward eventually embracing the culture of unbridled greed and exploitation that would come to typify the 1980s. More or less the same economic system was in place, but now the people operating it had a different agenda, different goals to pursue, and different definitions of success. On a similar note, I believe the reason that the managed German car industry has done so much better than the managed French car industry is one of simple competance. To my knowledge, there wasn't a markedly different approach to how they ran their respective industries, or a meaningful difference in their intentions or dedication - it's just that the French didn't really know what the hell they were doing, and all the good intentions in the world couldn't fix that fact for them. I would agree with G., that a lot of factors are in play, and salient among them must be the condition of the expert personnel (management, engineering, design, etc.) and the sense of national purpose. Probably the place to start would be studying each case individually and in fair detail. This is why an essentially ideological or philosophical approach like that of Commanding Heights ends up begging questions. Overall, I suspect you probably can't have large-scale economic development without state involvement one way or the other. My impression of both the Gilded Age and the last thirty years or so in this country is that what business really means by deregulation and the government getting off their backs is not that government does nothing, but that government does what they want. Certainly a lot of the key industries of the late nineteenth century like railroads, coal, and ranching prospered because government at every level was willing to make or guarantee cheap loans, let out land at bargain rates, enforce labor discipline and provide mass convict labor, etc. In other words (and here's my own philosophical, question-begging statement) I have a hunch you can't tell any economic history without talking about the active role of the state. The countries and regions that a non-expert like me thinks of as having chronically weak economies--Greece, much of sub-Saharan Africa, much of Latin America--tend to have weak governments that aren't capable of doing much, either to please business or people who like central planning. On individual cases, two points. First, the US economy wasn't exactly state run during WWII. The government worked with private industry on various boards and commissions to establish what needed to be done and how it could be done most effectively. The relative harmony created by a shared sense of purpose that all believed was both exigent and temporary helped. Second, it's a bit disingenuous to just casually stick "Stalin in the 30s" in there with all the others. There's central direction, and then there's central direction with state terror and mass death on an eye-goggling scale as routine tools of policy. My Brothers and Sister all over the world, I am Mrs Boo Wheat from Canada ; i was in need of loan some month ago. i needed a loan to open my restaurant and bar, when one of my long time business partner introduce me to this good and trustful loan lender DR PURVA PIUS that help me out with a loan, and is interest rate is very low , thank God today. I am now a successful business woman, and I became useful. In the life of others, I now hold a restaurant and bar. And about 30 workers, thank GOD for my life I am leaving well today a happy father with three kids, thanks to you DR PURVA PIUS Now I can take care of my lovely family, i can now pay my bill. I am now the bread winner of my family. If you are look for a trustful and reliable loan leader. You can Email him via,mail (urgentloan22@gmail.com) Please tell him Mrs Boo Wheat from Canada introduce you to him Thanks. What if Organized Crime Runs the World? Roberto Bolaño, "The Savage Detectives"